Somehow this past week was when ALL the classes were. Who scheduled my summer? Oh what, it was me? Past Me was not considering much else besides taking in knowledge and imparting it for the first week of August. Luckily I had some amazing company and everyone escaped not only unscathed but a little bit wiser. Thanks, Past Me. But phew. Monday kicked of Education Week with an NJMQG lecture from the MQG’s own Heather Grant. 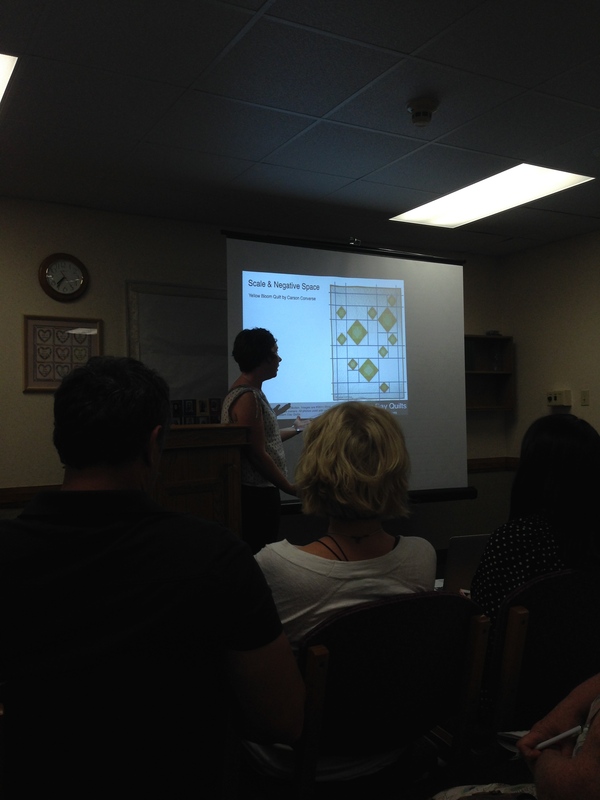 She was awesome enough to give us the first run of the Alternate Grid lecture that she’ll give at Quiltcon. It made me look at my quilt designs in a whole new way, gave me inspiration for designing in the future, and gave me lots to research. I saw so many awesome NJMQG friends, and we had plenty of guests too! Chris, a.k.a. The Tattooed Quilter joined us, as well as Jess from Quilty Habit and Michelle from Cloud 9 Fabrics (she even brought her husband!). I also got to spend time with Heather, who was fantastic company when we were in typical rush-hour Jersey traffic. 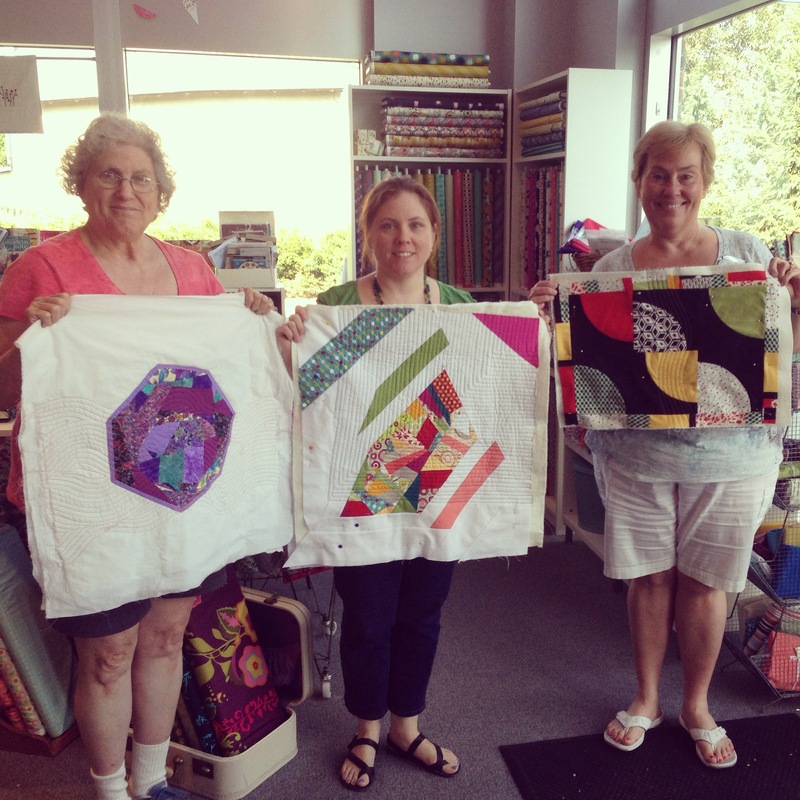 On Wednesday it was week 4 of our 5-week Beginning Quilting series at Rock Paper Scissors. All that’s left for students’ baby quilts is binding, which we’ll do this coming week. 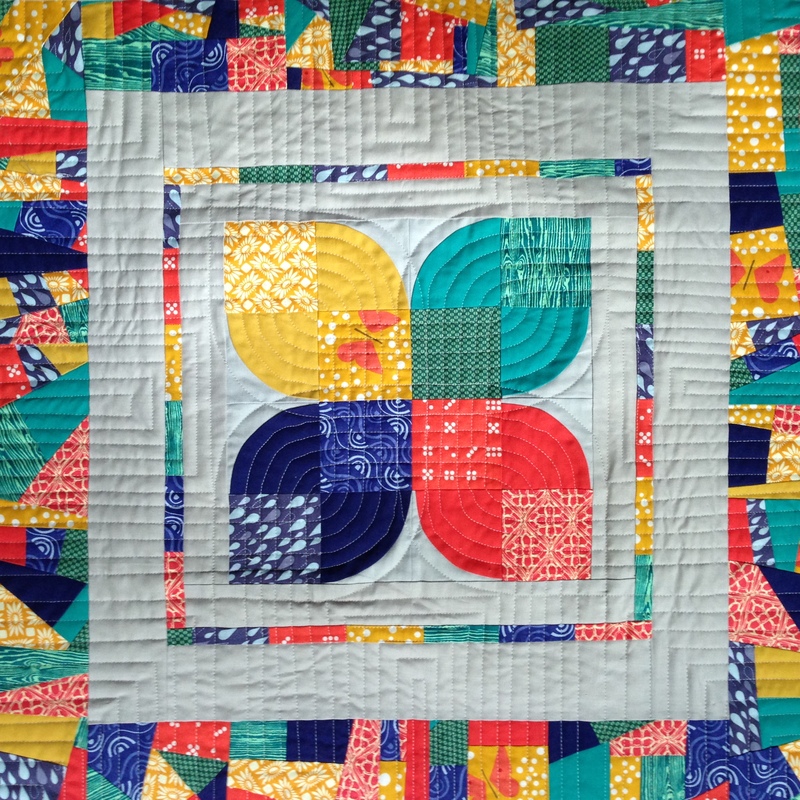 I can’t wait to share the finished quilts– they are coming along beautifully! 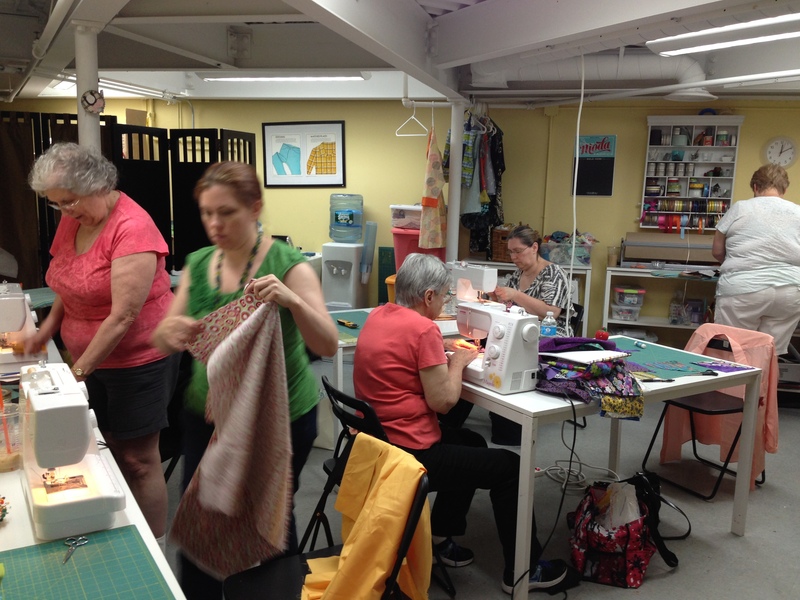 I have to admit, though, that all week I was thinking about Saturday and Quilt Camp at Rock Paper Scissors. It was another first for me– my first time teaching a full day class, from 10 to 5. Throughout the week my anxieties swung from “will we fill the time?” to “I hope we have enough time to finish our projects!” I should have know then that the contradiction meant I was well-prepared, but a little bit of nerves never derailed me before. 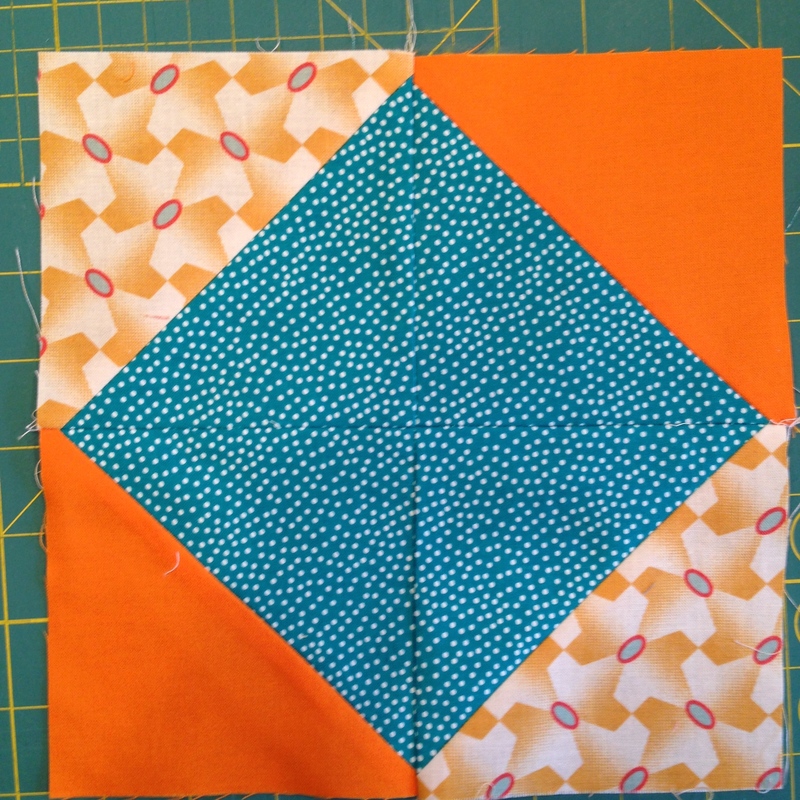 Regular readers have seen my sample grow (here and here), and know that I was planning three lessons for Quilt Camp– curves, improv, and creative walking foot quilting. I gave students a lot of creative freedom, and the final projects were guided by everyone’s perceived strengths on each lesson. And you know what happened? The day flew by. I kept close watch on the time and guided all six students (a full workroom!) toward near-completion of the lessons. It’s a lot to take in in a single day, and they were so open-minded and kind. I got all but one student in this shot– see? Kimberli is even blurry with motion. Ha. In the end, each student’s mini quilt was a wonderful representation of themselves and their experience. They ranged from very traditional and technical to very improvisational and just about every shade in between. At the end of the day, we were all tired and happy. I know everyone, myself included, picked up skills, and we exchanged tips and stories over lunch too. I’m ready to get back to my own sewing this week. Education Week gave me a lot to process, and I’ll do it fondly. Sounds like a great week with lots of awesome projects produced!!! I definitely need to time my NY work trip when you guys have some fun things on. This week sounds fabulous, students did a great job. OMG, those mini quilts!! Amazing! I’d love to take one of your classes sometime. It would be fun to teach a class together, too! 😉 It was fabulous to see you. The class was fun and I learned at least three major new skills. Yay! !